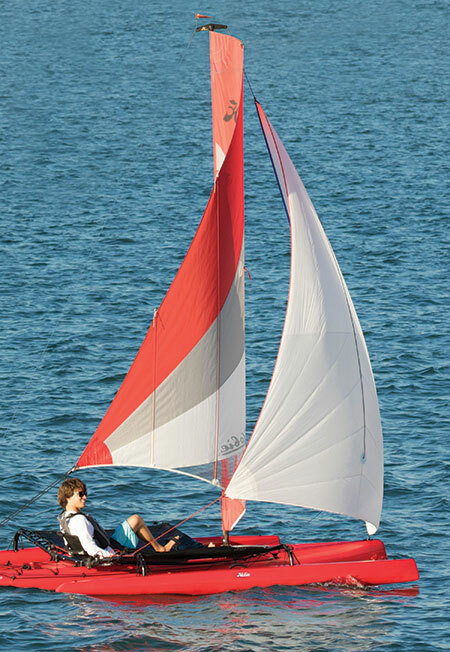 One of the hottest accessories for the Hobie Island is a spinnaker kit. We have made a couple of changes to enhance the ease of use of these great accessories to make them even better. There is an issue that has come up from time to time. When the sail is not in use, the spinnaker halyard / back stay can get hooked on the mainsail battens when tacking, gybing or when furling the sail. Keeping a bit of tension on the halyard to keep it from drooping and catching the batten ends is critical. This part raises the mast topper and gives more room for the battens to pass under the halyard. The following is the latest update and is available for all older kits at no charge. 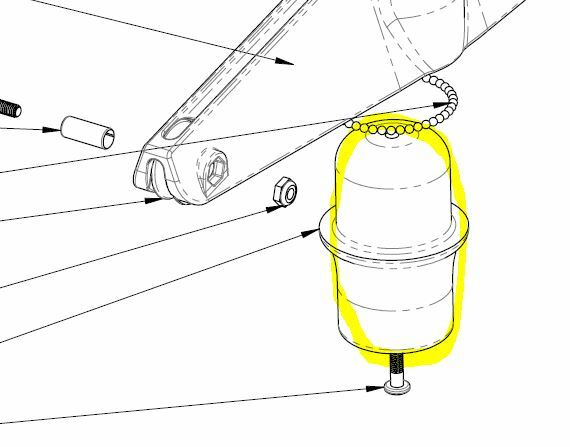 Designer Jim Czarnowski had intended to include a cleat on the aft crossbar at the end of the spinnaker bag (for the spinnaker retrieval line). This cleat is used to lock the snuffed spinnaker within the bag which allows tension to be applied to the halyard. You snuff the spinnaker and cleat the retrieval line. Then tension the halyard without pulling the spinnaker back out of the bag. This keeps the lines from drooping and catching on the battens. 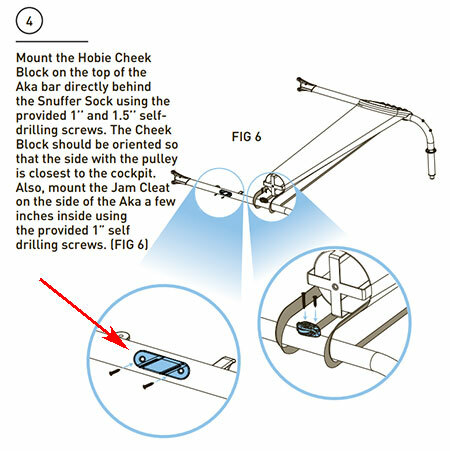 2 ea 8031032 - SCREW, 10-16x1" SELF-TAP S.S.
New instructions include information about the cleat placement and installation. Both items make for more care free use of the Island Spinnaker Kit. Proof of purchase or do we just go in for the free upgrade? I would say a photo of you kit would suffice, but we are not asking for proof of purchase. After a lengthy search for as many of the little bastards as I could find. I put a copious supply of white teflon grease on the horizontal ledge of the new part (which serves as the track for the delrin balls), and smeared some more on my fingertips, as the practical way to pick up balls and place them on the track. In due course, I had loaded all the balls I had located, only missing about 6-8, the absence of which does not seem to have affected the smooth operation of the rotator. So just be careful not to lose your balls! PS Matt. What is the part number for the rotator balls? Serious question. Thanks Matt. Does this mean that the balls are not a Hobie catalogue item, and that I need to source these from somewhere myself? Not currently listed in our catalog, so yes. Hmmm, I can't think of any other bespoke component of a Hobie product that is an orphan like that. 1. Like previously said, be very careful with the resin bearing balls in the topper. Those are easy to loose. 2. The cheek block is harder to place on the tandem island because of the support pole for the Aka and the other stuff that is on the back side of the Aka. You also need to check your tramp straps and make sure you put it in a spot that does not interfere with them. I ended up putting the cheek black a few inches to the right of the support rod at a slight upward angle, so, I could still fold the support rod for storage and snap it into the holder on the Aka. Trying the upgrades today. Loading everything up now. Will report back later on the results. 8-12 mph winds today. So, a purchase of Tandem & Spinnaker date of 3/2017 the cleat and SS screws are no charge updates and the longer rotator is a separate purchase?? I fitted the upgraded taller topper base to my TI today ...and it makes zero difference. First though, a big thanks to Tony for his heads up with the container under the topper. Those little balls can be easily lost. I was careful and used Teflon grease but still managed to drop one, fortunately into the bucket. Also, be careful not to tighten the screw too much or it won’t rotate smoothly. Just enough to be snug against the balls with no up/down movement. Turn the screwdriver in small increments to get it right. As I suspected and agreeing with Vetgam, the extra height is nowhere near enough to clear the batten. In fact this so called improvement is actually a backward step as for the first time the topper fell off the mast when I tried to adjust the halyard and I got a catastrophic tangle trying to furl. I had to pull into the shore to fix it. That never happened with the original topper. It doesn’t fit the top of the mast as well and will need further mods for a tighter fit. I don’t understand how Hobie could get this so wrong? An upgrade that makes things worse! On top of that I had to buy it (alright it was only $7-50) but it took about half an hour of fiddly work to fit. I love the spinnaker but I just wish it had been better thought out before it was released. You’ve got to wonder how much testing was actually done on both the original topper and now the upgrade? The topper needs to be much longer, not taller. Thanks for an honest review Stringy! My next move is to replace the 18 inch long piece of garden underground watering system plastic pipe (attached "dangling" from the rear of the topper by loose zipties) with a longer piece which will extend down the backstay further than the top batten of the mainsail. This >should< enable the sail to slide past the backstay when gybing. This won't reduce the possibility of the "halyard" part which runs down from the topper to the snuffer, but to date, that side has not resulted in any tangles. I am a bit surprised by the almost deathly silence from users of the spinnaker over in USA... aren't anyone over there (apart from vetgam) experiencing issues?